high quality watch that will keep in popular for many seasons. This is a luxury men wrist watch in two colors (gold and black). 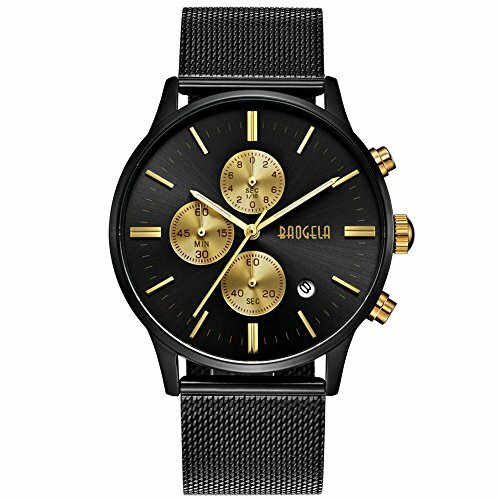 - Black Milan Mesh Stainless steel strap & High quality alloy Case, comfortable to wear. - A tool for adjust watchband. - High hardness glass mirror, scratch and wear resistant. - Chronograph - All sub-dials can work well. - Japan original quartz movement, keep precise time. - This watch is well packaged in a stylish and luxurious paper watch box. Unlike other seller's cheap and flimsy package. Customer Service: Please do not worry any quality problem, All watch in our store will enjoy 12 Month warranty. 30 Day money back guarantee for any reason. If you have any dissatisfaction, please send message to us on Amazon, we will do our best to make it right! - High quality Japanese quartz movement with analog display, provide precise time keeping. - Watch Functions: Chronograph - All sub-dials and hands are functional, Date Display. - Waterproof for daily use: 3 ATM Water resistant, NOT suitable for diving, swimming, snorkeling, water-related work. - Elegant and Luxury Design Men's Watch: This watch will come with a watch box. A Fashion Birthday, Christmas, Valentine day, Wedding, New Year Gift. - Purchase Without Worry: If you have any dissatisfaction, please send message to us on Amazon, we will do our best to make it right! The men casual business stainless steel watch. If you have any questions about this product by BAOGELA, contact us by completing and submitting the form below. If you are looking for a specif part number, please include it with your message.